This mod adds basic forging to the game. 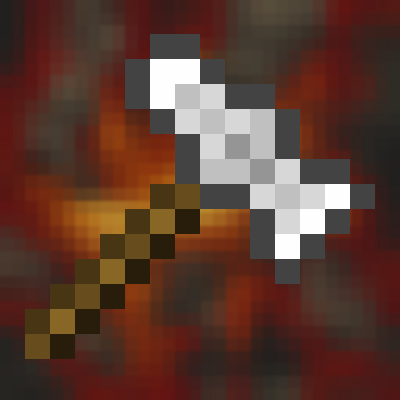 You must first acquire a Tinker's Anvil and Hammer - the basic tools of the trade. Then you will need to master heating items - either in a large open Charcoal Forge or a more conservative Brick Forge. When you heat ingots to the right temperature, they become Workable. Place them in an anvil and start hitting them to try and work them into shape. For detail about how forging works, see TerraFirmaCraft 1.7.10 forging rules. This mod has a Guide Book which is provided by Patchouli. It has explicit compatibility with Tinker's Construct, Construct's Armory, Adventurer's Toolbox, JEI, and Craft Tweaker for all your modpack making shenanigans. JEI and Craft Tweaker integration. Here is a mod showcase I made of this mod! Feel free to use it on this page if you find it helpful! I've notice that the obsidian part from tinker aren't craftable, i tried to add the craft myself and i found a little problem, i successfully add the craftin and in work, but the item the recipe output isn't a obsidian, it simply state "part has no data" am i doing somethin wrong? Tinker's tool parts need NBT data to specify the material - you need to add that to your craft tweaker script. So, how does it affect TC? Do you know if this is compatible with adventerers tool . box? 1) what's your modpack policy? 1) Go ahead! Just link back to this page for the source. 2) That could probably be added, yes. Hello AlcatrazEscape, i would like to know where do i change the anvil tiers? I'm using the 1.1.1 version of the mod! In 1.1+ they are fixed to the mining level of the material used. I need to increase the iron Anvil to tier 3 and steel anvil to tier 4, is there a way to do that? Not at the moment. I'm thinking of potential JSON based material configuration to come - not sure yet. I managed to find a way to modify the anvils tier, I just had to modify the metal tier of tinkers construct with the mod Tool Progression! How can I specify amount of material in CraftTweaker scripts? I'm not sure what you mean - what did you expect to happen vs. what didn't work?